Roast chicken is a classic dinner and perfect in any season. However, I particularly enjoy it in early spring because it’s a bit lighter than some of the heavier dishes we enjoyed through the winter yet is still hearty and comforting when the weather remains cool. It’s also versatile and can be served with any number of side dishes, from Roasted Green Beans with Shallots to Celery Root Slaw. And of course mashed potatoes are a must to soak up the delicious gravy. 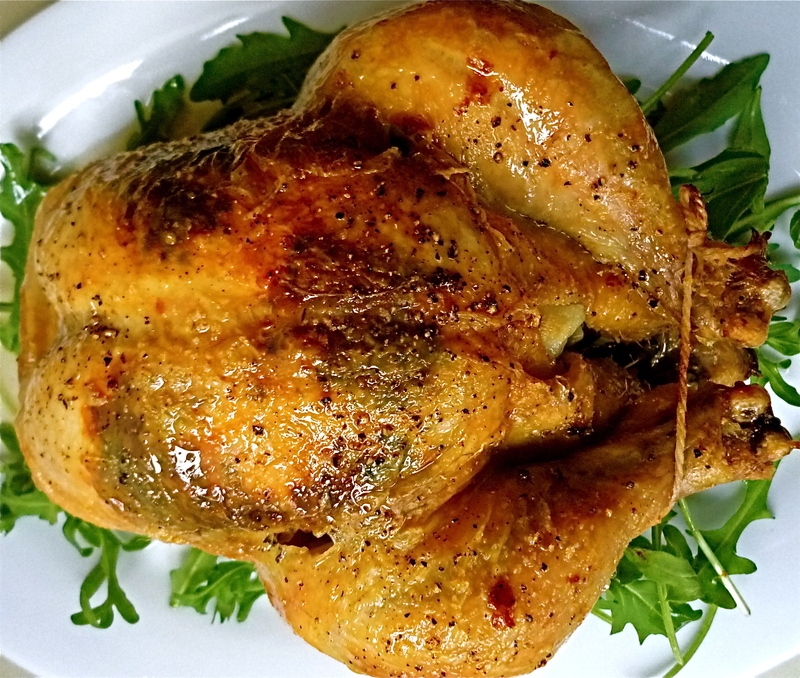 For more great ideas on how to use leftover roast chicken, check out my article Three Delicious Ways to Use a Rotisserie Chicken. To keep the breast meat from drying out and the cooking time reasonable, select a smaller chicken weighing around 3 lbs. (1.5 kg). It will only take about 80 minutes to roast, which keeps the white meat from becoming stringy and dry. If you’re serving a crowd, consider roasting two smaller birds instead of one that’s twice the size so the roasting time will remain relatively short and the meat will stay juicy. Tucking herb infused butter under the skin before roasting keeps the meat moist but also adds flavour. Filling the cavity with fresh herbs, onion and garlic helps flavour the chicken and adds depth to the juices, resulting in delicious gravy. Use fresh herbs instead of dried for a brighter flavour. Fresh sage, rosemary, thyme and parsley are readily available year round at most supermarkets. In a small bowl, add all herb butter ingredients and use a fork to mix until combined. Wrap herb butter in a piece of plastic wrap and form into a ‘log’ about 3” long. Place in the freezer until firm, about 15 minutes. (Herb butter can be made in advance and refrigerated until use). Preheat oven to 450 degrees Fahrenheit. Make sure the cavity of the chicken is empty and pat the skin completely dry with clean paper towels or kitchen towels. Drizzle one tablespoon of olive oil in the bottom of a small roasting pan and place chicken in the pan. Stuff the cavity with sprigs of herbs, garlic cloves and quartered onion. Remove the herb butter from the fridge and slice the log into ‘coins’ about ¼” thick. Carefully lift the skin covering the breasts and slip the herb butter rounds under the skin, making sure to cover as much of the breast meat as possible. Make sure the skin covers all of the breast and butter. Rub the chicken with remaining tablespoon of olive oil and sprinkle with a pinch of salt and fresh ground pepper. Roast in the oven for 20 minutes at 450 degrees Fahrenheit. After 20 minutes, reduce the oven temperature to 350 degrees. Set a kitchen timer for 1 hour. After one hour, check on the chicken. Use a thermometer to test the internal temperature, at a thick part near the leg. It should read 170 degrees Fahrenheit when ready. If the chicken is not done, return to the oven and roast for another 10 to 15 minutes. Once the chicken has reached 170 degrees, remove from the roasting pan and set it on a carving board to rest. 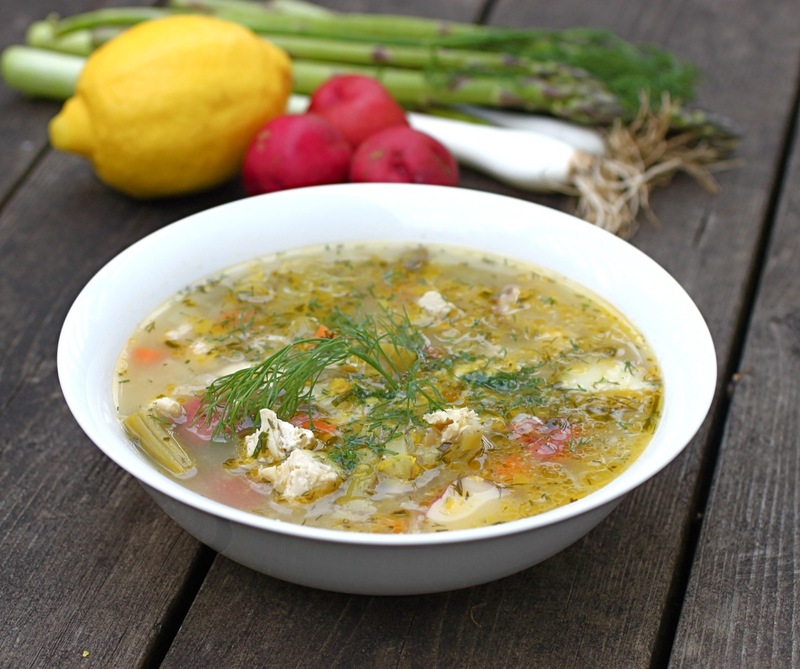 In a measuring cup, combine three tablespoons flour with one cup of chicken stock and whisk until smooth. Place the pan used to roast the chicken on a burner and bring the chicken juices to a simmer. Whisk in flour/stock mixture, add wine and cook until beginning to thicken, about 3 to 4 minutes. Season with salt and pepper to taste and strain the gravy through a sieve to remove lumps. Serve over carved chicken. Copyright Trish Coleman. Please contact the author to obtain permission for republication. This recipe first appeared on Suite 101.com.